The global market for neonatal intensive care holds commendable growth opportunities for market players in the contemporary times. The demand for neonatal intensive care has been rising which has assisted the growth of the market players. 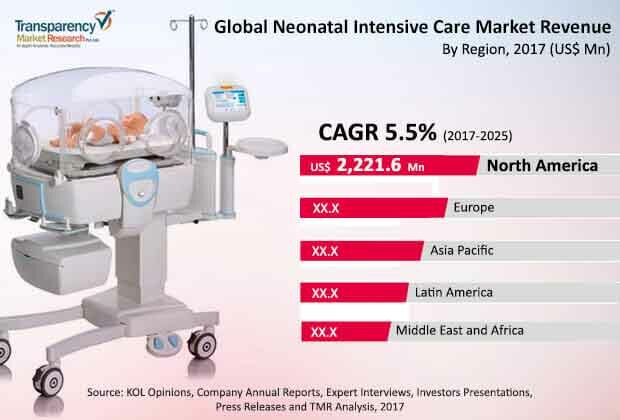 The leading market players in the global market for neonatal intensive care have been making ardent efforts to ensure that their position in the market is not compromised. Furthermore, these market players have also been focusing on producing the most effective and efficient systems for prenatal intensive care. It is expected that the cumulative efforts of all the leading players would amount to an increased level of competition in the global market. The smaller players have not proved their mettle in the global market and are yet to make major breakthroughs with regards to product innovation. It is anticipated that the medium and small-sized players would join hands to challenge the supremacy of the larger players. Furthermore, it is also projected that the larger market players would aim to strengthen the barriers to the entry of new players in order to keep reigning over the market. Some of the key players in the global market for neonatal intensive care are Teleflex Incorporated, B. Braun Melsungen AG, C. R. Bard, Inc., and Becton, Dickinson and Company. These market players have done especially well attracting the healthcare sector towards their products and offerings. The global neonatal intensive care market is projected to expand at a respectable CAGR of 5.50% over the period between 2017 and 2025. Furthermore, the global market is expected to stand at a net worth of US$9.0 bn by the end of 2025 as against a value of US$5.9 bn in 2017. Based on geography, the global market for neonatal intensive care is expected to be led by North America. The field of neonatal care has been making key advancements in recent times as the need for better care of new-borns has increased. The number of new-born kids who suffer from several kinds of diseases and disorders has also increased in recent times, and this has pushed demand within the global market for neonatal intensive care. Furthermore, the medical practitioners, doctors, and specialists have been focusing on the need for better neonatal care in order to ensure that the child is prevented from acquiring infection or diseases. This has given an impetus to the growth of the global market for neonatal intensive care. The government has also been pressing hospitals and healthcare centers to ensure proper treatment of infants and protecting them from hospital-acquired infections. Based on the type of products, respiratory devices have clocked in the highest demand in recent times. Several new born babies are seen to suffer from respiratory problems during their initial days due to a variety of reasons. It is also true that the demand for respiratory devices in neonatal intensive care has escalated due to the need for respiratory aids in women. The review is based on TMR’s report titled “Neonatal Intensive Care Market (By Product Type: Infant Warmers, Incubators, Convertible Warmer & Incubators, Neonatal Monitoring Devices, Respiratory Devices, Phototherapy Equipment, Catheters and others; By End-User: Hospitals, Childcare Clinics and Others) - Global Industry Analysis, Size, Share, Growth, Trends, and Forecast 2017 – 2025”.